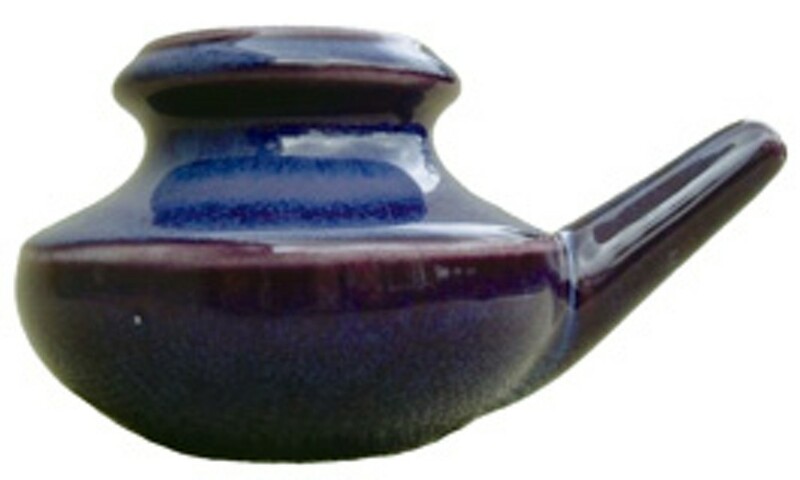 By Neti for Action POT OF GOLD: Many swear by the simple ways of the neti pot, like this one made by Red Hot Ceramics in Santa Rosa. Health comes in all shapes and sizes. Sometimes, it resembles a tiny teapot you stick up your nose. I know this, because at Christmas, I was given a small ceramic neti pot. If it weren't for the box of Kosher salt that accompanied the gift, I might have thought it was the world's smallest teapot. No doubt bearing a somewhat blank expression, I gazed down at the lovely little blue pot in my hands as my daughter Jenna and her health-conscious boyfriend, Bernie, enthusiastically explained the nature of their gift. Sometimes called a "nasal irrigator," once only popular within the yoga community and now going mainstream, the neti pot (rhymes with "yeti snot") is designed to clear out one's sinus passages by flushing them with water. Describing his own experiences with the mighty neti pot, Bernie colorfully exclaimed, "It's like a cathedral opened up inside my brain!" "I've been using one for a couple of months now," added Jenna. "I feel like I've never breathed so well in my whole life." The concept is simple enough: you fill the pot with warm water, dissolve some salt, turn your head sideways over the sink, insert the spout into your top nostril and slowly tip the pot as your sinus cavities fill up, until eventually the water pours from the other nostril. "I'm a little teapot, short and stout! Here is my handle—my nose is my spout!" Believe it or not, these weird little pots with the funny name are suddenly all the rage. Ancient in concept, their popularity skyrocketed a couple of years ago when Dr. Oz, appearing on the Oprah Winfrey show, demonstrated the use of the neti pot, proclaiming its many health benefits (while warning of possible side effects like sinus infection and—get this—"neti-pot addiction"!). As it turns out, two of the better-known manufacturers of neti pots are right here in the North Bay. NeilMed, a large maker of medical supplies, has a whole line of nasal irrigators, and the smaller outfit Red Hot Ceramics makes its own homegrown line called Baraka Neti Pots. Both have headquarters in Santa Rosa. So, what is it like to actually use a neti pot? My own first shot at neti cleansing—emotionally heightened by Jenna's warning that unless one uses the proper amount of salt, the experience can be "unpleasant"—was a bit wet and wild. The second I tipped the pot into my nose, I started choking, spraying salty water all over the bathroom. After understanding that my head was not tilted sideways properly, one small minor adjustment had me spouting like a faucet—and, yes, in a good way. The immediate effects of this nasal tsunami certainly were noticeable, the neti having opened up breathing capabilities I didn't know I had. And here's the other thing: once you get over the intrinsic "ick" factor and the sheer weirdness of it all, using a neti pot becomes oddly calming, and even kind of fun. That said, the jury is still out on whether I'll be making neti-potting a daily practice. Am I the next Sonoma county candidate for neti pot addiction? Who nose?—D.T. Ear-candling reminds me of that Columbia House record club I fell prey to when I was 13. Twelve free CDs sounded like the all-time greatest bargain until the mailman greeted me with Scorpions' Greatest Hits and Anne Murray's Christmas album. I'll admit that my preliminary research on ear candles led me to some grand expectations, like hearing oceanic vibrations and sinking into a deep relaxation. But honestly, when I tried it, all I experienced was a warmed-up ear and a smoky living room. There is evidence that humans have been practicing the therapeutic art of ear-candling since 2500 B.C.E. Many believe that it developed concomitantly with the domestication of the honeybee, whose beeswax is used to coat an unbleached cotton cloth that's rolled into a 9- to 12-inch hollow tapered candle. The candle is placed in the ear, lit on fire, and allowed to burn for about 12 to 15 minutes. According to enthusiasts, ear candles are effective at improving sinuses and hearing, cleansing the ear canal, restoring equilibrium, purifying the blood, opening the chakras, reducing stress and alleviating allergies. And while these purported benefits might conjure an image of snake-oil peddlers, perhaps they explain why stores like Santa Rosa's Community Market maintain healthy sales of the candles. In fact, the largest U.S. seller of ear candles, Wally's Natural Products of Auburn, Calif., reported sales of $1.2 million in 2004. Of course, the internet is loaded with scary tales of botched ear-candling, mostly involving hot wax dripping into the inner ear or perforating the ear drum. (For the record, my candles burned smoothly and seemed to pose no such threat.) According to the FDA, ear candles may not be sold as medical devices in the United States, and Canada has gone so far as to make ear-candling illegal. Interestingly, the most damaging aspect of ear-candling might be what they don't actually do. When I cut open the remaining candle to survey the detritus it had sucked from my ear, I found a lumpy deposit that looked a lot like candle wax. Turns out, it was. The widely believed myth that the candle acts as a sort of chimney to draw out excess ear wax is, given the density of the wax, scientifically unsound. As one doctor put it: "A good ear is like a good oven—it performs its own self-cleaning." So is ear candling really a valuable therapeutic art or a solution in search of a problem? For just three bucks a candle, you might as well find out for yourself.—J.D. Why can't a person have a serious conversation about vaginal irrigation without conjuring images of overly manicured, muscle-flexing, fake-tanning, kissy-face posing, vaguely aggressive anti-intellectual men? You know what I'm talking about: douchebags. The fact is, while calling a man a "douchebag" has become wildly popular in America, the practice of female douching has fallen out of popularity to a large extent. An earnest internet search for "douche bag industry" or similar phrases will yield pages and pages of man-hating rants and blogs as well as "I'm a Douchebag" T-shirts, and even a red plastic-y douche-bag Halloween costume, which is so unironic that it can only mean the term "douche bag" has reached it's zenith as a pop-culture force. So what if a person wanted to find information about douche bag sales figures? There's the www.douchebagmarketing.net website, but, alas, it is about "reviewing the spammiest online marketing techniques, not about marketing of feminine hygiene products." The situation has become so dire that no one seems willing to stand up for the original red plastic bag with an irrigation hose and nozzle, and declare, "Let's hear it for the douche bags." (Except for Kanye West.) That is to say, there seems to be no proud Association of Douche Bag Manufacturers to consult. So, as with most forbidden subject matter, the populace must glean what information it can from advertisement. On the topic of douching and douche bags, luckily, there is a colorful history in ads dating back to 1900, at least. The practice of female douching, however, goes all the way back to Hippocrates, at least. One of the best collections of these ads is retained by the Museum of Menstruation and Women's Health, affectionately called MUM for short (check out www.mum.org). Advertising can capture attitudes from a time and place with a poetic nuance and style completely absent in more scholarly works. In the 1920s, when douching was all the rage, adds showed pert young women peering coyly from under the brims of hats, hiding behind hand fans or sometimes looking sulky, while the voice of wisdom, indicated by large font, declared some vague form of female doom to befall women who didn't douche. "If only she had known!" the ads lamented. How "douchebag" became a slur is unclear. One reason for all the tiptoeing around douche bags and douching, according to MUM, is that douche was primarily used for contraception, not just "freshness" and cleanliness. Love in the time of Sterizol was still risky, as douching is not a reliable form of birth control. But it could be that douchebags (men) are a form of birth control for the new millennium, at least for the guy in the red douche bag costume, who has probably reduced his risk of impregnating a girl by at least half—the old fashioned way.—K.M.